There’s lot’s of numbers in personal financial planning, so it can get overwhelming fast. To keep the “overwhelmed factor” in its cage I hooked up with my good buddy and ad man extraordinaire Mike Edelstein to develop the graphic metaphors that you’ll see in this and other posts. 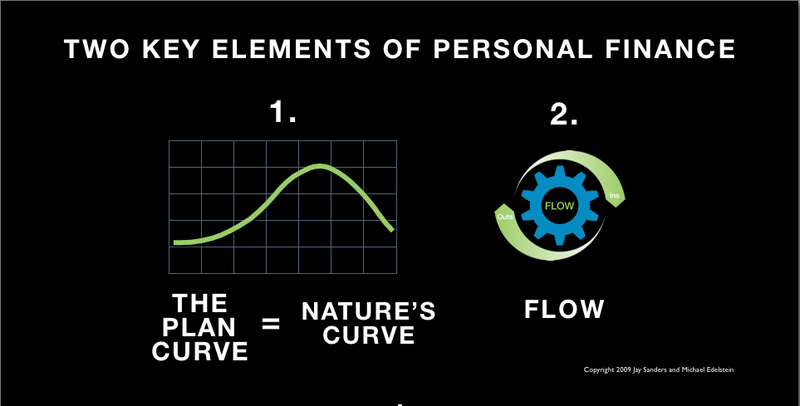 In my view of personal financial planning, ‘PFP’, you need to connect to two fundamental concepts: the Curve (aka ‘the plan curve’ and ‘nature’s curve’) and Flow. Add a bit of knowing about the context in which they operate (see Financial Literacy Basics) and you’re off and running, I promise. Ideally, our financial lives when plotted against time “should look like this.” Let me explain. In everyone’s life there will come a time when we no longer can or want to work. That point is at the top of the curve just before it start’s descending down to the right. Simply stated when that time comes you’ll need to have put away enough money (top of the curve) to live out the rest of your life. Let’s look it from nature’s perspective. It’s really no different. 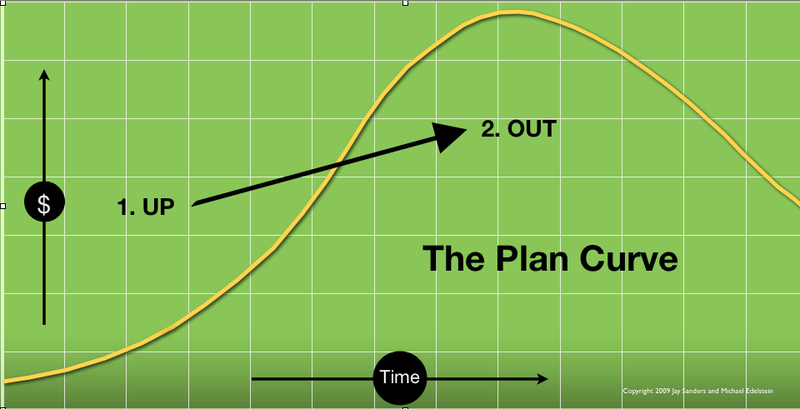 The Plan Curve is Nature’s Curve. Squirrel’s store nuts during the summer to survive the winter. In fact, they actually diversify by setting up multiple nut caches in case some are vandalized or destroyed. 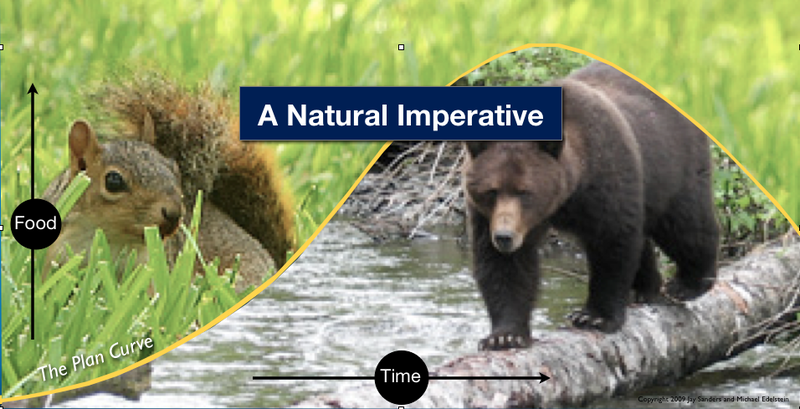 And bears beef up all spring, summer and fall so they can hibernate through the winter. Nature will run her course whether you’re aboard or not. That’s why I call it the “Plan Curve” and your curve should follow Nature’s Curve. 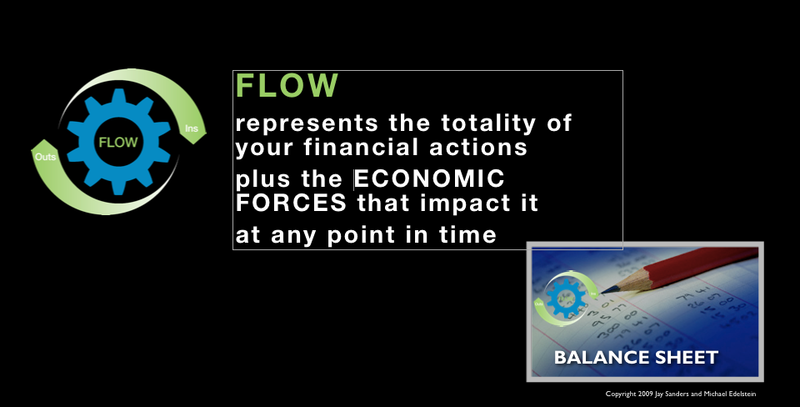 Flow represents the sum total of all your financial transactions to date. The path it traveled to get to there is your curve. Think of Flow as a point on a road map. It’s the location you’ve reached by a particular day. 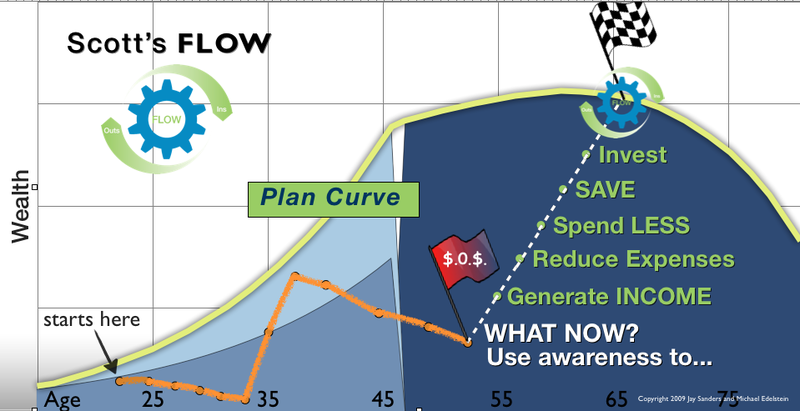 The Plan Curve is where you should have been. To bring this all together I’m going to introduce you to a client named Scott and describe his financial journey – which you’ll see reflected in his curve. Scott’s Flow followed the orange path. In his early 20’s Scott decided he wanted to be a public advocate and attend law school. To go to school he needed to borrow, so his flow headed down and away from the Curve. After graduating he landed a job in NYC’s advocate’s office. The pay wasn’t great, NYC’s an expensive place to live, so his Flow headed south. At 34, Scott, scored in two big ways. First, his uncle Pete died and left him a sizable inheritance. His flow shot due north, back towards the plan curve. Next, he married Barbara a corporate attorney working for one of New York’s white shoe firms. She was making big money. Now their Flow continued to rise toward the plan curve. Scott and Barbara were leading the good life. It looked like their financial life would be sweet. Scott, however, was approached by his friend Tom who had what seemed like an incredible real estate deal and invited Scott along for the ride. Scott accepted. Before too long the deal went south and with it his Flow starting descending. Then Barbara lost her job. Needless to say their Flow sunk further. Tensions mounted and reached a peak when Barbara sued for divorce. Scott was 53 and his prospects looked dim. I met Scott when he was 54. By then he had gotten over the divorce and was dating Judy. With a new take on life he asked me to help get his financial life in order. He had a new reality and wanted me to help get his financial life in order. His goal was financial independence by 65. I helped him develop the plan (see dotted lines from 55 to 65) and created the benchmarks we use to track it. It’s a couple of years in now and he’s on the way. This entry was posted in ABCs of The Curve, Financial Literacy Basics, Personal #s and tagged Financial Literacy, Financial Planning, Money Management, Personal Finance, Personal Financial Planning, Retirement Planning. Bookmark the permalink.